The Relished Roost: ORC the Waiting Game! Well, besides painting the pieces white which are coming along fine, I am waiting for rug, hardware, and dressers!! All were suppose to be in stock but low and behold we are in a waiting pattern. My daughter also threw a monkey wrench into the equation by telling me she really wants touches of dark brown in the room and does not like the art I picked! It was her photo of ballerinas that she did in class that I love and of course now she wants nothing to do with it.. so back to the drawing board! Ah the perils of parenthood! Here is were I am at now waiting, debating and painting. I love how everyone else's ORC challenges are turning out, you should all really be proud there is such talent in this world and we should all give each other a pat on the back! I feel your pain - my ORC room for my daughter was the most challenging room I've ever done because she kept changing her mind about things. It's going to end up beautiful - love everything you're using in it! It is going to be an amazing room Karolyn! I think a bright work of art would be the icing on the cake and complement the pillows! Love the whole plan. Hoping all your items will arrive soon!! Absolutely beautiful, Karolyn! Can't wait to follow! Oh my gosh..that is frustrating! It seems to take at least 8 weeks to get furniture these days...I'm waiting on a table that I ordered in June...it is now back ordered until Dec.
Oh I like the punch of brown! 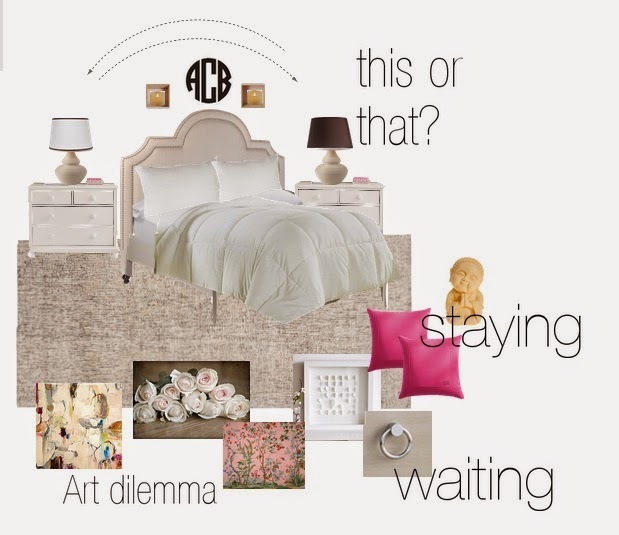 I love that bed and the monogram! I can't wait to see how the room turns out! Karolyn... aren't teenage girls fun? Never a dull moment. I am sure the room will be pure perfection... just like you! Love your ideas - fun and beautiful. I love the brown shade and the abstract painting, but all would look wonderful. Can't wait to see!! Too funny - these kids and their opinions! Either way, I love your ideas! Can't wait to see more!